54 THE SHOP JANUARY 2019 JANUARY 2019 Clearances p.54 Engine Products p.60 PRECISION ENGINE Tackling operating clearances for common V-8 applications. By Mike Mavrigian EDITOR'S NOTE: The following is the final installment in a three-part series examining operating clearances that apply to V-8-type overhead valve engines. Part I (THE SHOP, April 2018) looked at main and rod bearing clearance, main bearing inside diameter, bearing thickness variations, crankshaft end play and cam bearing clearance. 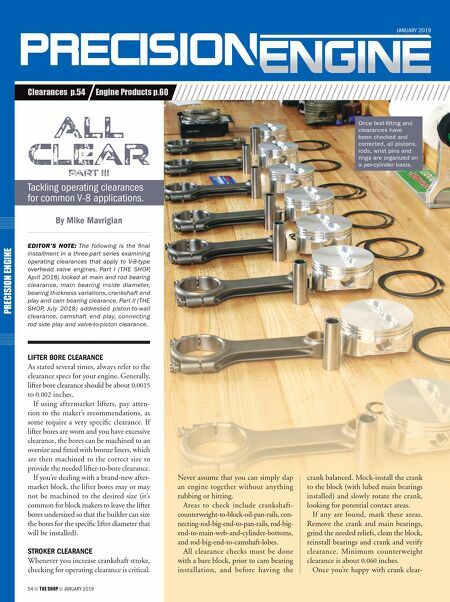 Part II (THE SHOP, July 2018) addressed piston-to-wall clearance, camshaft end play, connecting rod side play and valve-to-piston clearance. LIFTER BORE CLEARANCE As stated several times, always refer to the clearance specs for your engine. Generally, lifter bore clearance should be about 0.0015 to 0.002 inches. If using aftermarket lifters, pay atten- tion to the maker's recommendations, as some require a very specific clearance. If lifter bores are worn and you have excessive clearance, the bores can be machined to an oversize and fitted with bronze liners, which are then machined to the correct size to provide the needed lifter-to-bore clearance. If you're dealing with a brand-new after- market block, the lifter bores may or may not be machined to the desired size (it's common for block makers to leave the lifter bores undersized so that the builder can size the bores for the specific lifter diameter that will be installed). STROKER CLEARANCE Whenever you increase crankshaft stroke, checking for operating clearance is critical. A C PT III Never assume that you can simply slap an engine together without anything rubbing or hitting. Areas to check include crankshaft- counterweight-to-block-oil-pan-rails, con- necting-rod-big-end-to-pan-rails, rod-big- end-to-main-web-and-cylinder-bottoms, and rod-big-end-to-camshaft-lobes. All clearance checks must be done with a bare block, prior to cam bearing installation, and before having the crank balanced. Mock-install the crank to the block (with lubed main bearings installed) and slowly rotate the crank, looking for potential contact areas. If any are found, mark these areas. Remove the crank and main bearings, grind the needed reliefs, clean the block, reinstall bearings and crank and verify clearance. Minimum counterweight clearance is about 0.060 inches. 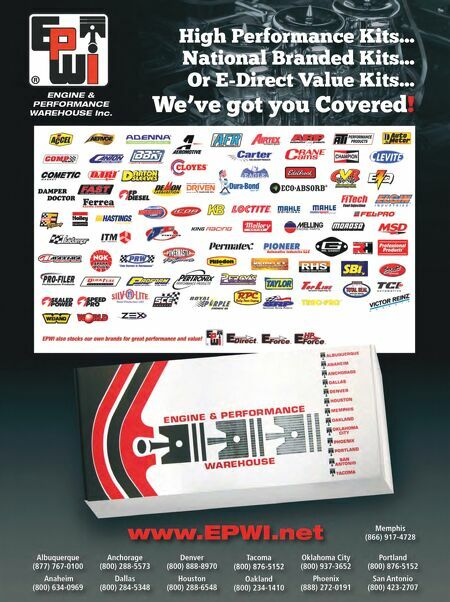 Once you're happy with crank clear- Once test-fitting and clearances have been checked and corrected, all pistons, rods, wrist pins and rings are organized on a per-cylinder basis.